When was the last time you saw a toad? It’s easy to forget that millions of uncategorized species (many of them tiny) still share the planet with us. The discovery of three new toad species in Nevada is a reminder of the remarkable biodiversity still hiding in nooks and crannies across America—and a forewarning of how human impact is imperiling the survival of species that haven’t even been officially discovered yet. The three new toad species—the Dixie Valley toad, Railroad Valley toad and Hot Creek toad—were discovered in Nevada’s Great Basin as part of a survey of an ancient lake bottom. According to the announcement, discoveries of new amphibians in the United States are extremely rare, and the last toad species to be discovered on U.S. soil was the now extinct Wyoming toad in 1968. The researchers are concerned that at least one of the new species, the Dixie Valley toad [Bufo (Anaxyrus) williamsi], is in danger of facing the unfortunate fate of the Wyoming toad in the near future. They are especially worried about the impact the construction of a geothermal power plant in the toad’s unique, thermal spring-fed marsh habitat—which totals just a few square miles—could have on the species. The power plant development, which being reviewed by the Bureau of Land Management for potential impacts on the toad, would pump almost 46,000 acre-feet of water per year from the natural underground geothermal reservoir. This could seriously disrupt groundwater flows and possibly drain the toad’s already limited wetland habitat. The Center for Biological Diversity has taken note of the toad’s situation, and is marshalling resources to ensure that the newly discovered animal’s survival. The conservation group already gathered more than 1000 letters to the BLM asking the agency to reconsider permitting the power plant. Amphibians are some of the most threatened animals on the planet, as their habitats dwindle and their numbers are ravaged by disease. According to the ICUN, of the 6,260 amphibian species assessed, nearly one-third of species, or some 2,000 species, are globally threatened or extinct. Upwards of half of all amphibian species are on the decline. One recent study found that two-thirds of the areas with the richest diversity of frog and salamander species on the planet will be affected by climate change, habitat loss, or fungal disease by 2080. So perhaps the Nevada toads have the right idea in seeking out survival in some of the most remote and hidden amphibian habitat around. 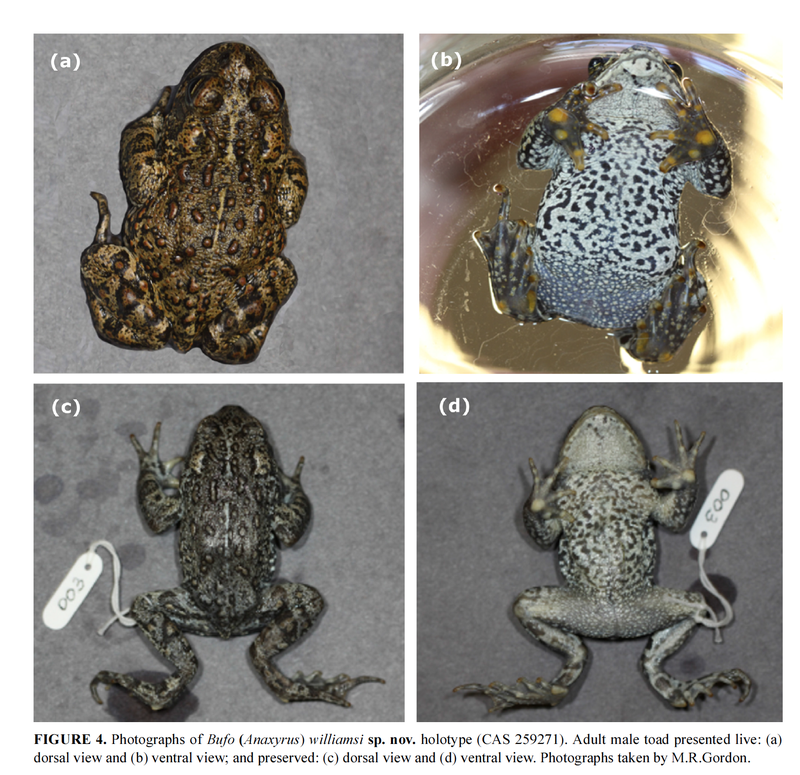 The discovery of the three new toads, the findings of which were published in the journal Zootaxa, was the result of a 10-year long survey by researchers at the University of Nevada, Reno and Paul Smith‘s College. All 3 toads are small in size—about two inches long when fully grown—and slightly different in coloration. They have been isolated from other populations for over 650,000 years and are native the Great Basin in Nevada, which was once covered by large marshes and giant inland lakes before becoming one of the most arid regions in the United States.